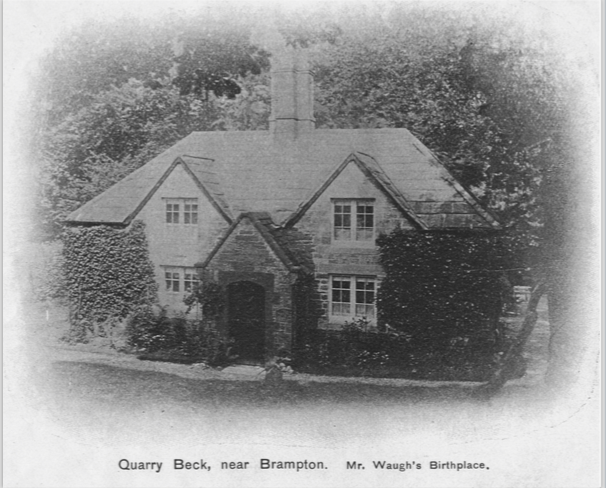 Quarry Beck House was the childhood home of Walter Davidson (Wattie). Feature Story 1 The oldest known Hardy was Joseph Hardy possibly born in Carlisle around 1780-1790. He married Ann Baxby on 6 October 1810 st Mary's Carlisle. Joseph remarried 31 August 1818 as a widower to Margaret Davison of the same St Mary's parish. I have found no birth or death record for Joseph. I also did not find a death record for Ann Baxby. The 1841 census confirms the children of Joseph to include Thomas Hardy. The wedding records can be found in the document section. Feature Story 2 The Davidson family of Quarrybeck married into the Waugh family. Wattie's uncle was Reverend Thomas Waugh who wrote a book called "Twenty Three Years a Missioner:. The opening "I [Rev Thomas Waugh] was born on September 3, 1853 at Quarry Beck House near Brampton in Cumberland, and few people have started life in a bonnier place. The quaint old cottage is bounded by a lovely trout stream. It stands at the western entrance to Naworth Park, and is one mile from Naworth Castle, the seat of the Earl and Countess of Carlisle. It is also one mile from the fine old priory at Lannercost, and two miles from the south-western point of the Roman Wall…..my mother [Elizabeth Davidson] was born in the same cottage and her mother [Esther Turnbull] went to it when six years of age. Being one of the older members of a large family, and her mother being left a widow a few years previously, my mother sorely needed in the old home. Consequently my father made this their home for three years after marriage and only left it for Cummersdale near Carlisle when I was nearly two years old. " A summary of my finding can be found in the document section.